This 7 day bicycle tour begins and ends in Beijing, China's capital. This tour is designed as a moderately strenuous ride. Average daily cycling mileage will be about 40 miles (65 km). On some days we will use vehicle transport to supplement the cycling to get us to the next destination. Riders will carry their own luggage in their bike panniers. This tour will visit both well-known and little-known sights and will appeal to those who have cultural, social and geographical interests. On the first day, the group will meet in Beijing in at the hotel and then go for an easy ride around Tian'anmen and the outside of Zhongnanhai (residence of current leaders) to get a feel for the city. If there is time we can take in a few sights such as the market areas and "hutongs" (the soon-to-be-extinct small alleyways of old Beijing). The next day, the group visit the Forbidden City (about 2 hours), Great Hall of the People, Mao Zedong Mausoleum (if the group is interested), and Tiantan (Temple of Heaven) Park. Night - Beijing Opera. The idea is to get a feeling for Beijing from the seat of the bike. On the third day, the group will cycle out of town to the Ming Tombs and onto Badaling Great Wall site and spend the night there. The next day, we will cycle to Huanghua (60 miles) for a more natural setting with the opportunity to hike the wall away from the masses. 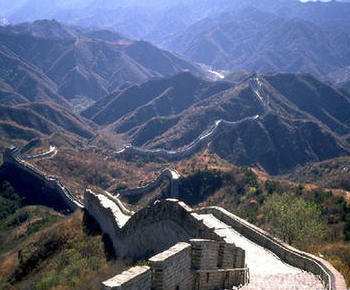 There are also a few places along the way where the Great Wall crosses the road. On the fifth day, the group will cycle 20 miles to Huairou then take a bus or truck (to skip over a busy highway) to Simaitai Great Wall site to hike for a few hours, then cycle another 20 miles to Luanping. On the next day, cycle 30 miles to Chengde, site of the 18th century Imperial resort which we will visit. This is a small city with several temples within easy cycling distance. On the seventh day, we will return to Beijing via train from Chengde, concluding the bike tour. Day 1: Beijing. Meet group members in Beijing, cycle to Tian'anmen and the outside of Zhongnanhai (residence of current leaders), and explore "hutongs" (Beijing small alleyways). Includes: (B), (L), (D). Day 2: Beijing. Forbidden City, Great Hall of the People, Mao Zedong Mausoleum, Temple of Heaven Park and Beijing Opera. Includes: (B), (L), (D). Day 3: Badaling. Ming Tombs and Badaling Great Wall site. Includes: (B), (L), (D). Day 4: Huanghua. View more of the Great Wall near road crossings. Includes: (B), (L), (D). Day 5: Huairou. Hike the Simaitai Great Wall site. Includes: (B), (L), (D). Day 6: Chengde. Imperial Summer Resort and several temples. Includes: (B), (L), (D). Day 7: Beijing. Return to Beijing via train. End of trip. Includes: (B), (L). Note: This will be a self-supported ride. This means that each rider will carry their luggage and alternative transportation (buses and trucks) will be used when necessary throughout the trip. - All group entrance fees. - Private meals, snacks and alcoholic beverages.